Bacteria that grow best at higher temperatures between 41 and 122 °C (106 and 252 °F). They can be isola ted from hot springs. ( T 0 °C ). Organisms that grow best in moderate temperatures between 20 and 40 °C. Their optimal temperature is 37 °C. Habitats of mesophiles include cheese, yogurt animals and humans. This is a ubiquitous protective and homeostatic cellular response cope with heat-induced damage in proteins. Upon a shift from 30◦ to 42 ◦C bacteria transiently increase the rate of synthesis of a set of proteins called heat shock proteins (HSPs). 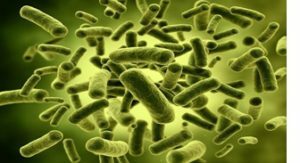 Nearly 50 heat shock–inducible proteins identified in E. coli. Cytoplasm: Cytoplasm is energy rich, reducing and osmotically stable. Periplasm: While periplasm lacks ATP, oxidizing and in contact with the external milieu. The σᴴ regulon provides protection against cytoplasmic thermal stress. The E. coli rpoH locus (htpR) encodes a 32 kDa σ factor, also called σᴴ or σ³², redirects promoter specificity of RNA polymerase. The σᴴ protein regulates the expression of 34 heat shock genes. 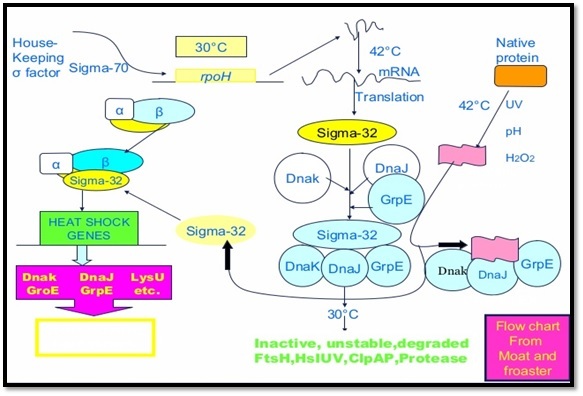 Heat shock first causes an elevation in σᴴ levels, which in turn increases the expression of sigma H target genes. First, a temperature upshifts from 30 ◦ to 42 ◦C results in the increased translation of rpoH message. Cis-acting mRNA sites within the 5’ region of rpoH message form temperature- sensitive secondary structures that sequester the ribosome-binding site. At higher temperatures, these secondary structures melt, thereby enabling more efficient translation of the rpoH message. In addition to the increased translation of rpoH message, the σᴴ protein itself becomes more stable, at least transiently. 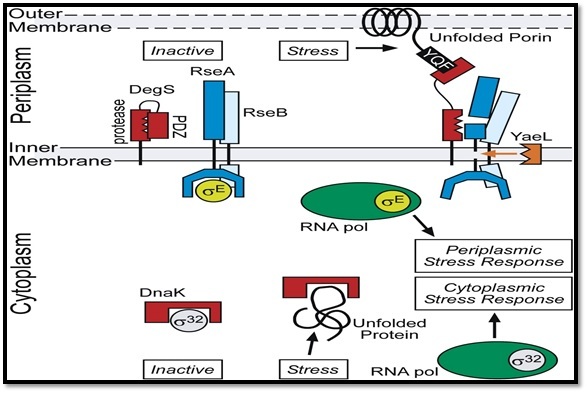 The mechanism regulating proteolysis centers on whether σᴴ associates with RNA polymerase. During growth at 30 ◦C, σᴴ can be degraded by several proteases including FtsH, HslVU, and ClpAP. If σᴴ is bound to RNAP, σᴴ is protected from degradation. The cell uses the DnaK-DnaJ-GrpE chaperones to interact with σᴴ at low temperature, sequestering σᴴ from RNA polymerase. Failure to bind RNAP facilitates degradation of the σ factor. Upon heat shock, increase in the number of other unfolded or denatured proteins occur that can bind to DnaK or DnaJ. This reduces the level of free DnaK/DnaJ molecules available to bind σᴴ, allowing σᴴ tobind RNAP, which protects σᴴ from degradation. When cell reaches the adaptation phase following heat shock, the levels of DnaK and DnaJ rise (both induced by σᴴ) and can again bind σᴴ, redirecting it toward degradation. 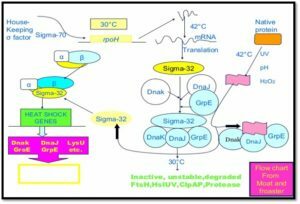 In addition to translational and proteolytic controls, production of σᴴ is regulated at the transcriptional level via a feedback mechanism. There are four promoters driving rpoH expression. Three of which are dependent on σ70, the housekeeping σ factor. The gene encoding σ70, rpoD, is also a heat shock gene induced by σᴴ. So, increased production of σᴴ increases σ70, which increases transcription of rpoH. The fourth rpoH promoter is recognized by another σ factor, σᴱ, encoded by rpoE. Agents that inhibit DNA gyrase. Induction by all of these stimuli occurs through σᴴ. How can all of these diverse stresses activate rpoH? The only explanation that appears reasonable is the accumulation of denatured or incomplete peptides. 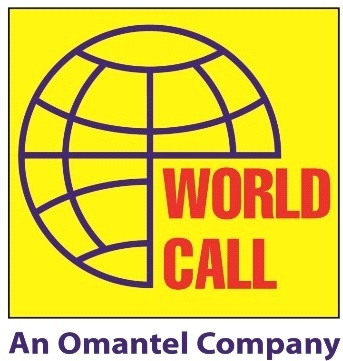 There is a potential alarmone that has been implicated in signaling expression of this global network. The molecule is diadenosine 5-, 5-P1, P4-tetraphosphate (AppppA), which is made by some aminoacyl–tRNA synthetases (e.g., lysU) at low tRNA concentrations. How this may influence the response is not known. 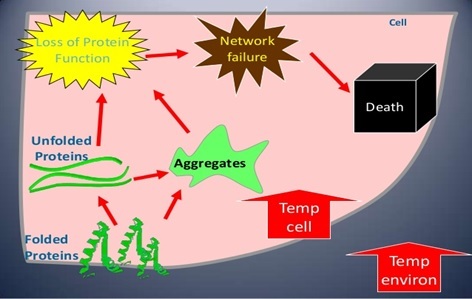 These pathways are induced by accumulation of misfolded proteins in the periplasmas under stress. σᴱ is a member of the extracytoplasmic function (ECF) subfamily of σ factors. The gene encoding σᴱ, rpoE, is the first member of an operon followed by the genes rseA, B, and C. RseA is a transmembrane protein whose cytoplasmic C-terminal domain interacts with σᴱ, acting as an anti-σfactor. The periplasmic face of RseA binds to the periplasmic RseB. Extracellular stress in some way signals increased proteolysis of RseA by the periplasmic protease DegS, thus relieving the anti-σ effect of RseA on σE. 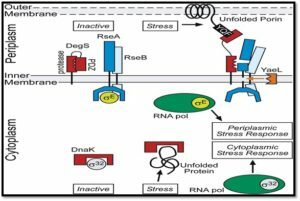 It has been proposed that Rse Band perhaps other periplasmic proteins involved in protein folding protect RseA from degradation by binding to the RseA periplasmic domain, capping the target site of DegS. Stress-induced misfolding of periplasmic proteins would titrate the RseA cap proteins off of RseA, rendering the anti-σ factor vulnerable to attack by DegS. The result would be increased activity of σᴱ leading to increased levels of σᴱ protein and RseA anti-σ (since they form an operon). The increased amount of σᴱ will drive further expression of genes whose products handle the periplasmic damage while the of RseA will enable the cell to down regulate the system once the capping proteins are again free to bind and protect RseA from DegS degradation. CpxR as the cytoplasmicresponse regulator. 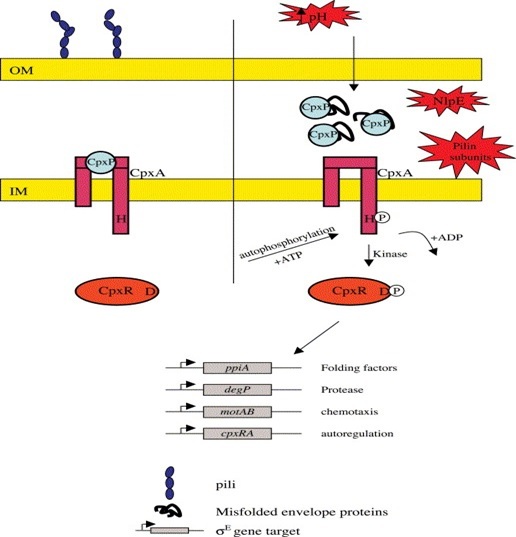 CpxA responds to envelope stress by autophosphorylation followed by phosphotransfer to CpxR. CpxR∼P activates expression of those genes that response to heat shock.